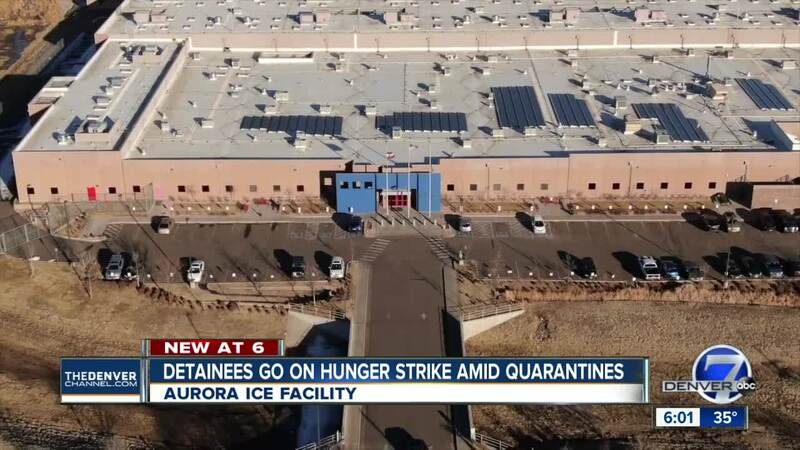 AURORA, Colo. — Detainees at a U.S. Immigration and Customs Enforcement (ICE) Detention Center are conducting a hunger strike in response to repeated infectious disease quarantines. This week, more than 200 detainees in the Aurora Contract Detention Facility are under quarantine, meaning they cannot visit with family, attend court hearings or leave their respective detention pods. Concern is growing for the families of the detainees, as some 65 have been under a mumps quarantine for two months and have just been told that quarantine will now start over again and will last another 21 days. Priscilla Cruz-Moreno’s husband Henry is one of the 65 heading into another quarantine. “We are going on two months now. It's inhumane," she said. “He's in pod B4,” she said. “The pod decided to strike, which means they are not going to be eating food." Priscilla says her husband's pod inside the ICE detention facility has now been placed a quarantine for mumps and chicken pox for the third consecutive time — more than 60 straight days. Danielle Jefferis, a University of Denver-based attorney, has been fighting for the rights of these detainees for months. "We are hearing that detainees are getting extremely frustrated because they don’t know why these quarantines are being extended. And the consequences of the quarantines being extended are pretty great," she said. Those consequences include no family or attorney visitations, court and bond hearings cancelled, and ultimately a delay a justice. She has a message for GEO Group, the private contractor paid to operate the facility. “Improve medical care in the facility. These infectious disease outbreaks should not be happening and should not be lasting as long as they are," Jefferis said. And that's the foundation for the frustration. This wife of one detainee says the men are not being told what’s going on, just that their quarantine keeps getting extended. Now it’s led to a hunger strike.